One of the most common causes of heel and lower foot pain is plantar fasciitis; a condition typically existing in people with flat feet. While plantar fasciitis can be a debilitating condition, there are special shoes that can work wonders to soothe your pain. To assist you in finding the best shoes for plantar fasciitis, we have compiled the 10 best shoes for plantar fasciitis for 2016; the 5 best shoes for men, and the 5 best shoes for women. We have chosen these shoes after thorough research, and are confident that we’re providing the premier plantar fasciitis shoes on the market. Of the women’s shoes reviewed, the ASICS Women’s Gel-Kayano 21 Running Shoes are the best because of their premium heel support and comfort. They are technologically-advanced shoes that can be found for as low as 76.99 on some online retailers. The New Balance Women’s WX711 Graphic Training Shoe is a great and inexpensive shoe if you are a sedentary person who is not into exercise. But, the shoe’s soft cushion and lack of arch support can cause pain if you wear it for exercise. Overall, the Vionic by Orthaheel Kona Mesh Lace Up Women’s Sneakers have a lot of heel and arch support. Their problems lie in how wide they are and in the lack of cushion they have in their heels. 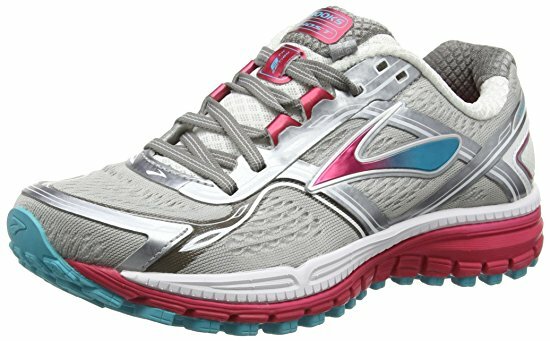 Brooks Women’s Ghost 8 Running Shoes are fantastic running shoes for people with plantar fasciitis, as they provide the premier heel and arch support in the world of running shoes. Unfortunately, they are not great shoes to wear casually, as they will eventually start to cause you some pain. While the Saucony Women’s Ride 8 Running Shoes provide great support and cushion for people with plantar fasciitis, they have their flaws. In particular, they are very narrow and lack durability, meaning you would have to buy new pairs quite often. Of our men’s shoes reviewed, the Mizuno Men’s Wave Alchemy 12 Running Shoes provide the most structure and heel support, making them our favorite choice for people with plantar fasciitis. Though they are a bit expensive at around $127.00, they could very well be worth the price if they provide you with healthy feet. New Balance Men’s M990v3 Running Shoes have been proven to heal injured feet and provide excellent heel support in doing so. But they also have the tendency to fall apart after a short amount of time, making them less desirable. While ASICS Men’s Gel-Kayano 21 Running Shoe is a great shoe for providing heel support as well as limiting heat build-up, it tends to be a bit narrow for people with wide feet. It’s also not the most durable shoe on the market. 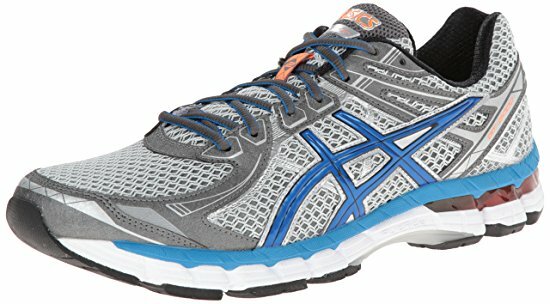 ASICS Men’s GT 2000 2 Running Shoe is a great shoe for plantar fasciitis, as it provides cushion and heel support. The problem is that it might also provide you with knee pain. Brooks Men’s Adrenaline GTS 16 Running Shoe undoubtedly gives you excellent heel and arch support, making it a great shoe for walking and running. But, it is not a very durable shoe, and might also be a little too narrow for people with wide feet. ASIC’s Gel-Kayano 21 running shoes are the latest edition of their Gel-Kayano series of shoes, which are known for providing excellent heel comfort and stability. Made from a synthetic material with rubber soles, the shoes provide the customer with firm, but forgiving feel and excellent breathability. The shoe’s 1.5” heel is equipped with the new Heel Clutching System, giving the customer great arch support with very little slippage. This will keep the foot in place and reduce risk of straining the muscles that are already stressed by plantar fasciitis. Also accommodating the heel is FluidFit multi-directional stretch with a rear and forefoot GEL cushioning system. This will allow the foot to move freely in any direction with cushion supporting it at all times. Inside the shoe there is a Moisture-wicking Ortholite X-40 sockliner that serves to absorb any sweat that might build up in the shoe so that you won’t developer rashes or sores. These shoes do a great job at maintaining excellent foot health, with several customers noting that their pain had actually disappeared after a couple weeks of wearing them. Many customers also spoke of the general comfort provided by the shoes, with one customer saying the shoes make you feel like you’re running on clouds. New Balance has a reputation for making stellar running and training shoes, and the WX711 Graphic Training Shoe upholds that reputation. The shoes have rubber soles and are made from a combination of synthetic and textile material. Providing heel support in the shoe is a heel pillow comfort insert. This insert cushions your heel but also gives your heel a firm, stable service that serves to keep it from moving around and coming down too hard. The synthetic mesh fabric provides your foot with excellent breathability and ability to move freely in each and every direction. Your foot won’t feel like it’s trapped and unable to behave naturally. The breathability of the shoe will ensure that your foot doesn’t become waterlogged with sweat, keeping it fresh and dry, and reducing foot rash. Reviewers like these shoes for their affordable price and excellent comfort. Most reviewers said that they could wear them anywhere for any period of time without feeling foot pain. A few complaints were that the shoes don’t have the greatest arch support and that they have a little too much give. Reviewers said that they’re great for walking, but that they aren’t always perfect when doing heavy exercise. Orthaheel is a brand that’s dedicated solely to making shoes for people with heel and foot pain. They have always been a leader when it comes to making plantar fasciitis footwear, and this sneaker is one of their best shoes on the market today. The shoe is made from mesh and has a sole with a great deal of texture, giving it excellent traction on a number of surfaces. Because of this, the shoes can be worn for just about any purpose, from athletic training to casual wear. Its stellar arch support helps to balance the instep of your foot, keeping your foot from over stretching. This keeps injuries from developing or getting worse, leaving you in a state of constant comfort. The shoe’s design helps to re-align to, and keep the natural alignment of your foot, preventing foot injuries caused by improper walking technique. Your foot will land in the right and most healthy position with the use of these shoes. Reviewers love how breathable the shoe is, and say that the toe box, in particular, allows for a great deal of space to move without being so loose that your foot will slip. Others laud it for its fantastic arch and heel support, which keep their ankles from rolling or heels from slipping. Some reviewers did not like the sole of the shoe as it’s made of a hard plastic material and not rubber. Some also complained of it being too wide and leaving too much room for their foot to move around. Brooks is a lesser known shoe company, but they make products that are just as good as any other shoe company. Their Ravenna 7 running shoes are made specifically for people with mild foot pronation and provide a great deal of structure and support. The shoes are made with mesh, allowing your foot a great deal of breathability and ability to stretch in any direction. At the same time, they have a great ability to absorb external moisture, keeping your feet dry and comfortable. The sole of the shoe is made of rubber and provides a great deal of give when running. Couple that with the inside of the shoe, which allows your forefoot and heel to act and move independently from each other, and you have a shoe that provides a great deal of comfort and support. Because the shoe is very lightweight, it lands softly, making it a durable product that keeps you from having to put too much weight on your feet. This will reduce the chances of injuring or worsening foot pain. Reviewers love them for their comfort and the fact that they don’t leave blisters, even when worn for the first time. Many reviewers also loved the look of the shoes, and specifically the shoes’ colors. Some reviewers complained that the toe box is a little cramped, but that has more to do with personal foot size. Saucony makes some of the most respected running shoes in the running community. Their shoes also happen to have a great deal of support to accommodate people with plantar fasciitis. The shoe’s exterior is made with mesh, allowing for excellent breathability and foot flexibility. It has a rubber sole which gives you a cushioned, but firm and shock-absorbent surface for your foot to come down on with each step. The heel of the shoe provides fantastic support which means that your foot won’t slip in and out of the shoe, causing injury. It also has excellent arch support, which will keep your foot in line and comfortable. They’re very light shoes, which is good for you because it will keep your foot from landing with too much pressure. This reduces the risk of injury and of making your plantar fasciitis worse. Reviewers love them for their excellent cushioning, and very light weight. Many reviewers stated that the shoes completely healed them of their plantar fasciitis. Some reviewers complained that the shoe was a little narrow, and that the toe box was too cramped. Other reviewers question the shoe’s durability, saying that they were beginning to fall apart after just a bit of running. New Balance has always made great shoes for people suffering from painful foot conditions, and the M990v3 running shoe is no different. Like all New Balance shoes, this shoe provides you with excellent heel support as well as stellar foot re-alignment. It’s made from a combination of leather and fabric, which gives your foot a firm, but flexible structure to move around in. The sole of the shoe is made from rubber, which absorbs shock and provides your foot with firm, but cushioned landing in each step. The toe of the shoe is made with blown-rubber which reduces the weight of the shoe and ensures that you are coming down with reduced force in each step. This will lessen the strain on your feet, resulting in less foot pain, and reducing chances of further injury. The shoes have very good heel support, as the back of the shoe is very firm and wraps around your heel in a very snug manner. It provides excellent arch support as well, which is great for people with flat feet. Many reviewers have called this the most comfortable tennis shoe they have every worn, and have said that they will continue to invest in this shoe. They love it because of its ability to heal foot pain, and for the fact that it fits people of all foot sizes. Some reviewers have complained that the shoe wears out too quickly, saying that they only made it through a couple of months of use. Another complaint is that the shoes are on the expensive side, which could be a problem considering how fast they wear out. Like the women’s Gel-Kayano 21 Running Shoe, the men’s Gel-Kayano 21 is one of the best shoes on the market for people with plantar fasciitis. It fits snugly and prevents heel slippage, acting as an extension of your foot. It’s made from a synthetic material that fits to your foot, but that also allows your foot excellent movement and flexibility. The sole of the shoe is made from rubber, giving your foot an excellently firm, but forgiving landing surface. The heel of the shoe is elevated 1.5” inches, providing your heel with great support that keeps it from slipping and coming down too hard when you step. It will essentially force most of the weight of your step towards your toes, keeping the majority of the weight off your heels. The shoe also does a great job of not letting heat build up, giving the foot excellent breathability. Many reviewers regard this shoe as the most comfortable shoe they’ve ever worn, with one reviewer saying that he’s tried many other shoes, but that these are the only ones that don’t make his feet ache. A great many reviewers have said that this shoe actually completely healed them of their foot pain. Some reviewers have complained that the shoe is too narrow for people with wide feet. Other reviewers have said that the heel of the shoe irritates them, and that it was worn down after only a couple months of use. As one of the premier running shoes on the market, Brooks makes truly great shoes that produce foot comfort, and reduce foot pain. This of course means that they produce shoes that are great for people with plantar fasciitis. The Adrenaline GTS 16 is made from mesh, allowing your foot fantastic flexibility as well as excellent breathability. The shoe’s rubber sole gives your foot a cushioned landing as it absorbs shock and provides a firm, stable surface for your foot to come down on. An Extended Caterpillar Crash Pad gives the shoe great heel-to-toe transition, taking weight off your heel and reducing risk of injury. That, combined with top-notch heel and arch support provides your foot an excellent shoe capable of giving you proper foot alignment as well as an artificial arch needed for people with flat feet. Reviewers love how the shoes take the landing pressure off the balls of their feet and into their toes instead. They also stated that the shoes are great for both running and walking, which means you can wear them at all times. A few reviewers were not happy with the durability of the shoe, saying that it was beginning to fall apart after around a month. One reviewer complained that the shoes began to give him knee pain after about a month. This shoe by Mizuno is not as popular as some of the other shoes on the list, but it is just as effective. The shoe’s stiff heel gives you a very stable and firm structure to keep your heel from slipping in and out of the shoe. Both the sole and exterior of shoe are made from synthetic material, with the sole also containing some rubber. The rubber-synthetic hybrid of the sole creates a shock-absorbent surface with a great deal of traction, lending itself to any style of terrain. The shoe’s Dynamotion Fit Technology ensures that it fits with great snugness, reducing heel slippage and unnecessary foot movement. This will give your foot a comfortable, structured fit that limits injuries. Reviewers with over-pronation and flat feet love this shoe for its stiffness, as it keeps their feet snug in one place. They also loved the cushioning in the middle of the shoe because it provided a softness to an otherwise stiff shoe. Some reviewers think that the soles of the shoes are too hard, as they don’t provide as much give as just a simple rubber sole. There were also complaints of the shoe running a little too small. ASICS has a reputation for making great running shoes, and running shoes have a reputation for having great heel great support, so it should come as no surprise that another ASICS shoe is on our list. The GT 2000 is made from synthetic material and has a rubber sole with a FluidRide mid-sole, giving the shoe excellent flexibility with a firm and stable build. This provides you with excellent heel-to-toe weight transfer, reducing stress on your heel, and reducing risk of injury in the process. A GEL cushioning gives the shoe some give to go with its firmness, providing you a soft, but stable surface to land on. Reviewers love the shoe because it provides great cushion without sacrificing heel support and structure. They also say that the shoe has held up very well, as they have put hundreds and hundreds of miles on them without them losing any cushion. Detractors of the shoes are upset that some of the synthetic pieces in the sole have fallen out. Does plantar fasciitis always necessitate special shoes? While there are orthotics and heel braces available to help with plantar fasciitis, most doctors recommend wearing shoes that are made to accommodate people with plantar fasciitis. These types of shoes are more effective than simple orthotics or heel braces. They will cause you to use the muscles around your ankles and lower leg more. Because of this, the muscles will strengthen, thus helping to heal pains in the area. They will provide your heel a great deal of support, which will keep it from slipping and coming down too hard. This will keep your heel from suffering unnecessary stress. They will provide your foot an artificial arch. This will keep your foot from overstretching and causing injury. What makes the best plantar fasciitis shoes? Special shoes are always recommended for people suffering from plantar fasciitis. Continuing to to walk around in shoes with poor heel support will result in continued and worsened pain, making your condition worse. Great shoes for plantar fasciitis have excellent heel and arch support, and have a firm, but cushioned landing zone. These shoes will serve to keep the majority of your landing weight off the balls of your feet, reducing the strain on your heel. Shoes with firm soles. If the sole is too soft and flexible, you will begin to feel pain in the heel and lower foot. The proper fit. Having shoes that don’t fit your foot perfectly well cause your feet to slip or not align properly with the arch, causing pain. A shoe with a firm heel. The back of the shoe should wrap around your heel snugly and be strong enough to support your heel from slipping and moving around. Squeeze the heel of the shoe. If it’s firm, it has excellent heel support. If it’s soft, it does not. Shoes with an upward bending toe. The front of the shoe should not be flat with the rest of the shoe. It needs to curve upward, as this will help to take weight off your foot when you step. Strong arch support. Because plantar fasciitis is usually caused by having flat feet, you need a shoe with strong arch support to create a sort of artificial arch. Unfortunately, not all shoes are created equally. And when you have plantar fasciitis you must be hyper-vigilant as to what type of shoes you’re purchasing. If you make the wrong purchase, you risk worsening your already severe foot pain, and perhaps even pushing it to the point that it can’t be reversed. It’s a delicate process that must be taken seriously. We have helped you to find a shoe that provides excellent heel and arch support, and that locks your foot in so that it doesn’t slip all over the place every time you take a step. This is vital to healing your condition so that you walk comfortably again. In our review, the ASICS Women’s Gel-Kayano 21 Running Shoe is our top women’s shoe for plantar fasciitis, and the Mizuno Men’s Wave Alchemy 12 Running Shoes is our top men’s shoe for plantar fasciitis. Each shoe is at the top of its class because it provides premier heel support, with a cushioned but sturdy sole that allows your foot to come down softly which each step. These shoes are also great because they fit almost every person who purchases them, and are proven to reduce foot pain in many customers. Finding a good pair of running shoes is hard enough – what with getting the right support you need, making sure they aren’t going to kill your feel while you “break them in”, and so on. But add in the added difficulty of being flat-footed (meaning you have a very small arch in your foot), and finding a good pair of shoes, running or otherwise, becomes a serious chore. ASICS Women’s GEL-Kayano 21 Running Shoes eliminates some of that chore, providing great support and stability for not only a normal foot, but a flat-footed one as well. Are you a overpronator runner, meaning you twist your feet, shins and knees outward and have pain as a side-effect (you can tell by looking at your shoes, if they tilt inward on a flat surface, that’s a good indicator that you are)? These ASICS help with that too! Rated 4.5 stars out of 5 stars on Amazon, let’s check out why everyone loves these ASICS. The upper of the shoe is made to easily stretch around the top of your foot providing a great fit while still allowing breathability. The GEL cushioning is placed where the ball of your foot rests and the padding of your forefoot hits which provides you shock absorption with your every step you take. The heel clutching system in the ASICS GEL-Kayano 21 running shoe keeps your foot aligned and provides stability as your run and/or walk. This really helps with overpronation. The guidance line system in these shoes allow for a more stable connection between the forefoot and the heel as you move. The FluidFit Design utilized a combination of multi-directional stretch mesh and stretch reinforcements to create a comfortable fit. Dynamic DuoMax increases stability and support while reducing the overall weight of the shoe. The new sockling in the ASICS GEL-Kayano 21 Running Shoe is thicker and more cushioned. It provides 40% better bounce-back and durability than the standard sockliner. 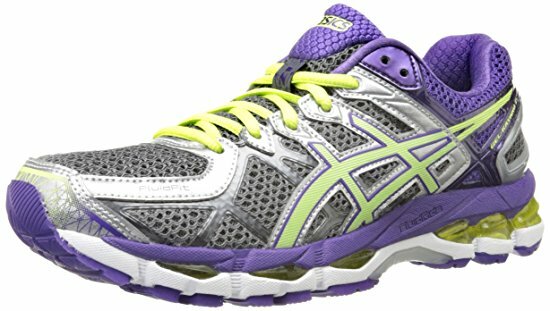 ASICS Women’s GEL-Kayano 21 Running Shoes work to provide more stability for a runner even on a rougher terrain. The Dynamic DuoMax Support System increases this stability and support and the FluidFit makes the shoes feel glove like and comfortable on your feet. Anyone can wear the ASICS Women’s GEL-Kayano 21 Running Shoes and will find them wonderfully cushioned and supportive. With that said, they’re most ideal for those who are flat-footed and/or overpronates as they run. They’re great for beginner runners, old school runners, happy-just-walking athletes and everything in between. However, it is recommended that if you tend to supinate in your gait – turn your foot inward – as you run, you may want to avoid these shoes as they could destabilize you as you run. The heel clutching system and Dynamic DuoMax System combination really adds a stability to the shoe that supports your feet even on a rougher terrain walk/run. The extra cushioning in this shoe keeps your feet feeling comfortable, whether you’re just walking around the mall or running on a dirt path. The FluidFit Design allows the shoe to stretch over your feet so they fit comfortably. The combination of the FluidFit Design and the Dynamic DuoMax system really allows for those who have flat-feet and/or overpronate as they run to have the extra stability and support they need to be comfortable as the move. This newest model of ASICS Kayano shoe is the lightest yet. It isn’t as heavy on your feet as you run, unlike the other models, but still has more cushioning that makes them more plush and comfortable on your feet. ASICS Women’s GEL-Kayano 21 Running Shoes are on the pricier side. Many say that, though a bit more expensive, they are definitely worth the extra money you spend and they prove to provide your feet with what you’ve paid for. The new sockliner, though more cushioned thus providing better bounce back and durability, doesn’t allow for as much breathability as a standard sockliner. This makes the shoe run a little warmer. Most of the customer complaints were that this model of Kayano shoe fit too narrow/small than their standard size. This is due to all the added cushioning this model provides and can be easily resolved by buying a half size up from your standard size. Customers who have reviewed ASICS Women’s GEL-Kayano 21 Running Shoes have generally expressed very positive feedback. Nearly all complaints that have been reported were in relation to the fit of the shoes feeling smaller due to the extra lining and cushioning this shoe provides. This is easily remedied by buying a half size up from your standard shoe size. Both those who are flat-footed and not, have commented that the shoes are comfortable and supportive of their feet as they both walk and run. Others have said that they prefer an earlier model of the shoe because they don’t like the fit as well. A few customers noted that they didn’t feel like they had to have that “break in period” with these shoes. The Kayano 21 shoes were already that comfortable on their feet. Many customers noted that the shoes were on the pricier side, however most found that they were well worth the cost and definitely got their money’s worth for them with all they provide in comfort and stability in their use. If you’re flat-footed and/or overpronate as you run or not, ASICS Women’s GEL-Kayano 21 Running Shoes might just be for you. This shoe provides wonderful support and are very comfortable with the extra cushioning. They may have a tighter fit, but going up half a size easily solves this problem. There is little question as to why they’re rated 4.5 stars out of 5 stars on Amazon and considered the one of the best running shoes for those with flat-feet and/or overpronate as they run. They are on the pricier side, but when you think of what all you put your feet through throughout the day, don’t they deserve the best you can get in support? Mizuno has long been a leader in lightweight, affordable running shoes. Through their proven wave technology, Mizuno has created an optimal running experience. The Wave Alchemy 12 has a lot to live up to when it comes to its predecessor, the Alchemy 11. For the avid fan, you will be happy to know it does its job well. From comfort to cushioning to support, this shoe is an exceptional product for both the serious runner and for those requiring a dependable walking shoe. The comfort factor is a product of a well planned design and keeping in mind the needs of the wearer. With the Wave Alchemy 12, Mizuno created a lightweight shoe with an incredible amount of breathability. Feet tend to sweat with increased activity. When this happens, the feet swell, and it can become difficult to walk or run longer distances in heavy, constricting footwear. Wearing a lightweight shoe, like the Wave Alchemy 12, allows the feet to breath, creating a more comfortable fit and an overall enjoyable experience. Running enthusiast know that it may take a while to wear in a new pair of shoes. Another great feature to the Wave Alchemy 12 is the highly durable, rubber sole coupled with the Dynamotion Fit technology. The special design of the sole limits the stress put on the feet, by cushioning them while running. The carbon rubber sole will wear down and shape to your foot faster than other models, allowing for a full capacity run within hours, rather than days. 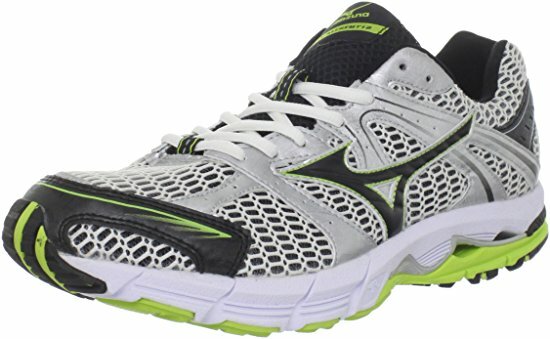 Mizuno has manufactured this shoe using their patented Double Fan Wave Technology to create a more stable running shoe. Patented wave plates scatter the force of energy evenly throughout the shoe which creates the perfect heel to toe conversion. The midsoles are designed to be more flat, and the base of the shoe has been made wider to ensure an even, secure platform of support. Lightweight foam inside the heel also adds to a secure foundation while giving the wearer extra bounce when running on a hard surface. The one critique that past users seem to have about the past Wave Alchemy shoe is that the outer appearance is not visually appealing. The Wave Alchemy 12 now pops with an added hue of green along the top and the bottom sole that pleasingly attracts the eye. This shoe offers a breathable, lightweight design that is also supportive. It doesn’t take long to wear in the shoe which is a great advantage for consistent runners who don’t want to wait for a shoe to form to their foot. The support of the Wave Alchemy 12 also makes it a good choice for those needing a stable walking shoe with a secure fit, such as consumers suffering from overpronation or injuries resulting from overpronation. Mizuno has a strong reputation for designing a dependable and affordable running shoe. The heavy-duty rubber sole wide base design provides impressive support. Excellent cushioning and sturdy arch support. Notable breathability to ensure a prolonged comfortable wear. The location of the arch is positioned further back than in other models which may put extra pressure on the ankle while running. This may go away when the shoe is sufficiently worn in. However, some runners may find that it hinders their running style significantly. Unlike the previous Wave Alchemy models, this shoe may feel shallower, initially displeasing some who are loyal to the brand name and design. Runners with flat feet tend to overpronate when they run. This means that while the heel makes initial contact to the ground, the foot rolls in further than normal. Many consumers who bought the Wave Alchemy 12 running shoe expressed that if you have a foot that has overpronation, then this is the shoe you need. They love that it is lightweight but offers the support they require to avoid the foot pain they were experiencing after long runs. Other reviews suggest that those who suffer from the intense pain of plantar fasciitis would benefit from the rear rigidness of this shoe. It provides the right amount of support to the feet and can be worn for an extended amount of time. Likewise, the support of the shoe is good for those who tend to be of a heavier weight because it will keep ankles and knees aligned. The foam padding helps to cushion the feet that may take extra pounding from the additional weight. Experts recommend replacing your shoes every 300 to 400 miles. Many consumers were pleased that these running shoes did indeed last that long, even during runs on many different surfaces. They felt that there was not a breakdown of the shoe after prolonged use. It performed just as well at 300 miles, as it did at 100 miles. There are very few complaints from consumers. Most are very happy with the shoe and have stated that the manufacturer claims regarding comfort, support and affordability were right on point. The one criticism that came up was that the Wave Alchemy 12 was designed slightly smaller in length and width than the previous Alchemy 11. For some this resulted in too tight of a fit. The Wave Alchemy 12 designed by Mizuno is an attractive running shoe, at an affordable price, that offers sufficient support and comfort. This is a reliable, sturdy shoe that will hold up during long distance runs on various terrains. The lightweight construction will not weigh the foot down, and the breathability factor will allow air to escape to reduce swollen, sweaty feet. The heavy-duty cushion sole will take the impact of pounding on the pavement for a smooth and comfortably stride. The Wave Alchemy 12 is definately rated as a highly recommended product that stands behind its claims and offers an amazing running shoe. 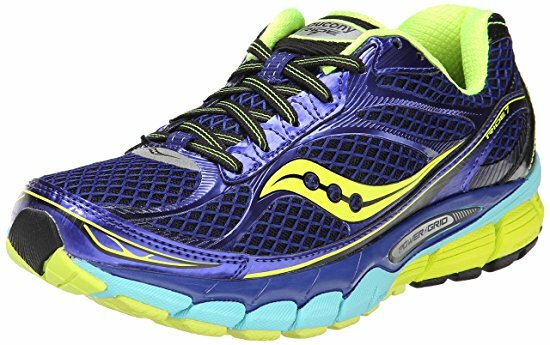 The Saucony Ride 8 Women’s Running Shoe is a lightweight version of Saucony’s previous running shoe that incorporates a comfortable feel into a long lasting, fashionable pair of foot wear. Each one weighs .5 ounces less, and they included an outsole that is redesigned for better cushioning and durability while running. A seamless feel is achieved with the welded overlay, and this shoe is constructed of an open air designed mesh that allows your feet to breathe while you exercise. You’ll feel cooler and more comfortable as this running shoe moves with your foot in one fluid motion. This running shoe features a synthetic, open air mesh that allows the foot to breathe. This is a high quality shoe that is imported from China. A rubber sole is a part of the construction in order to offer superb traction. A heel to toe 8mm drop is found with this particular running shoe. The reflective silver detail on the heel adds additional safety. The RUNDRY exclusive collar lining is included. The sock liner is constructed with ComfortLite for a comfortable fit and feel. How Does This Running Shoe Work? An Ultra premium, lightweight cushioning foam known as Powergrid is used in the construction of the Saucony Ride 8 Running Shoe. When compared to other running shoes, this one offers you more rebound and a smoother ride while exercising. The heel to toe 8mm offset ensures that the cushioning effect is evenly distributed throughout each shoe. This allows your forefoot and heel to remain at the same height which means your body will stay more balanced. More balance equals more comfort with every step. The outsole is created from an extra lightweight iBR+ rubber that will enhance the shoe’s cushioning features. Every bit of this shoe’s design was developed with your over-all comfort and ease of running in mind. No matter what time of the day you run, you’ll be safe with the reflective features that enhance your visibility to others. Anytime you run in low light situations such as dawn or dusk, you’ll have the added protection provided by a reflective heel. Who should buy the Saucony Ride 8 Running Shoe? This running shoe is ideal for any women who takes running seriously and is looking for a good shoe that will add to the benefits of their exercise routine without causing any discomfort. The Saucony Ride 8 is incredibly lightweight. This design feature allows the shoe to remain comfortable throughout your workout. Without the weight of many similar running shoes, you’ll realize your legs and feet will feel less fatigued after your run. A durable and strong shoe is created from combining features such as the iBR+ rubber, the RUNDRY lining, the ComfortLite sock liner, and the breathable mesh body of this shoe. This is also the perfect shoe for those who enjoy an early morning run or a late evening outing. The reflective features applied to the heel of the shoe make you more visible to traffic when running along the road side. Along with safety, this Saucony running shoe provides balance that isn’t found in all shoes. The 8mm heel to toe difference aligns your body for greater comfort during and after your run. The pros are quite obvious, and they include all of the features already mentioned. Safety, comfort and durability are at the top of the list of excellent qualities found in this shoe. It also comes to you at a reasonable price point. When compared to similarly priced running shoes, this footwear offers much more in its construction and design. Best of all, it remains to be a very fashionable shoe. It comes in the following color options. One of the only cons associated with the Saucony Ride 8 Running Shoe has to do with its width. It can feel slightly tight, and it does have a narrow fit. The overlay found inside of the shoe can cause irritation and blisters, especially in the toe area. Those with bunions find it to be quite painful, but in many situations the problem can be resolved by ordering a slightly larger than normal size. Those who have purchased this shoe love how the heel fits snugly and comfortably. This relieves any slipping that may cause irritation to the feet. The tongue lies perfectly, and the wider toe box allows the toes room to move. Online reviews rave about the excellent support provided by the Saucony Ride 8. Even those who have worn them to run marathons state that they remain comfortable after several hours of wear. The shoe itself is durable and holds up well. There is plenty of cushioning that doesn’t flatten out over time. Some people have bought these shoes to help alleviate aches and pains. Owners have found they make an excellent daily shoe when suffering from problems such as Plantar Fasciitis. Although the manufacturer makes no claims to health benefits, many noted that their knee pain had subsided after wearing this particular type of shoe. They also appreciate the fashionably bright colors that are not usually found in shoes with so much support and beneficial features. The Saucony Ride 8 Running Shoes for women are perfect for any female runner who is looking for balance, support, and breathability in a fashionable piece of footwear. The 8mm heel to toe drop offers excellent balance and alignment for the body while the synthetic mesh keeps your feet cool and comfortable. If you want a high quality, comfortable running shoe that won’t let you down, purchase the Saucony Ride 8 Running Shoe for women today. If you have high arches, you know that you have to be careful when choosing the shoes that will not only look good, but that will also be a comfortable fit. It isn’t always easy to find the shoes that provide you with both qualities. You may be browsing around to find out why, what, and how to wear shoes for your type of feet, because you are tired of walking and living with pain that is often associated with high arches. We know that you want is to find the right price, fit, and look when buying shoes. It can seem nearly impossible to hope for all three when shopping for “special shoes” for your high arches, but they do exist. Fortunately for you, we have found some of the best shoes available for high arches in 2016 and we have compiled a comprehensive list for you to be able to choose what will work best for your needs. Some of the shoes on our top 10 list come with price, beauty, and comfort all packed into one single design, while others offer one over the other, but all of these shoes are worth checking out. Read on. What is a high arch and why does it hurt? If you are trying to understand whether or not you may have a high arch and you didn’t realize it, take a look at your foot. Do you see a highly raised mid-section where the arch of your foot is? This is a high arch. Another way to determine if you have too high of an arch is if you feel a lot of pain in your heel, which usually shows up after a lot of walking or wearing the wrong type of shoes for too many hours. This can be caused by your feet receiving all of the weight of your body onto the heels instead of it being spread out evenly. Some people are born with it and some people develop higher arches due to using high heels or shoes that are not good for their type of feet. High arches can also develop due to disease, such as from polio or muscular dystrophy. Heavier people with high arches may feel more pain due to the excess weight being placed on their heels. Why look for special shoes? Why should you look for shoes that are made especially for high arches when you suffer from the pain that is often associated with high arches? Some people may wonder what to look for when buying this type of shoes and if it is even necessary to be aware of whether or not they are made for high arches. “Can’t I just buy a normal pair of shoes and add insoles?” You can, but your feet deserve and need pampering. When you have high arches, your feet tend to get tired faster than your average shoe buyer. Buying shoes that are especially designed for your type of feet and your needs will not only help to take away pain caused by long hours standing or walking in uncomfortable shoes, but will also help to prevent future problems. Many people consider “special” shoes to be uglier than normal shoes, but when it comes to your health and comfort, do looks actually matter? Fortunately, there are shoe makers who keep comfort and aesthetics in mind and there are shoes for high arches available on the market that offer consumers with affordability, quality, and comfort. When looking for shoes for your high arch, you want to find shoes that offer equality in balance between heel and toe, as well as comfortable soles and insoles. This can make a big difference for you when you want to be able to walk without fear of pain or discomfort. These sleek shoes are not only attractive for women who care about their wardrobe, but they provide anyone with foot issues-especially high arches-with the ability to spend the day on their feet without pain. The Vionic with Orthaheel Tide II Women’s Sandal has the kind of support that is necessary for people with high arches. The shape is both feminine and sturdy. While they aren’t the type of shoes that you would want to buy to wear for a formal event or a night out at a dance club, they will definitely keep you sane when your feet scream out for comfort. While many people like to use them around the house, they also work well for those moments when you want to look nice but feel comfortable. Made out of leather and webbing material with a rubber sole, they are a comfortable buy for the price range of $44.39-$74.95. Although we aren’t crazy about the “between the toe” style, the comfort and functionality of these shoes makes up for that. They do take some time to be broken into, but once they adjust to your feet and you adjust to them, the support for your heal is amazing. If you are a man looking for a pair of shoes that offer durability and comfort, the Brooks Men’s Adrenaline GTS 14 Running Shoe are a favorite on the market today. While they are sold in the price range of $119.99-$199.99 and may seem a bit costly and we may prefer a lower priced pair of tennis shoes, the comfort they provide people with arch problems makes them worth it in the end. The Brooks Men’s Adrenaline GTS 14 Running Shoe have a saddle design that is adjustable making them perfect for people who are looking for extra support. Many taller or larger men appreciate them for how supportive they are, whether they are used for running or simply for walking around in. When it comes down to what really matters in a good pair of shoes, the Brooks Men’s Adrenaline GTS 14 Running shoe offer long-lasting life and adjustable comfort, which is really what people who care about finding the perfect shoe are looking for. The Extended Caterpillar Crash Pad is what comfortable shoe dreams are made of as they help you have a heel to toe transition throughout your run. The Saucony Men’s Triumph 11 Running Shoe has great cushioning and padding. With a simple yet attractive mesh design for an exterior and a great rubber sole, the Saucony Men’s Triumph 11 Running Shoe brings comfort and functionality to the table. The design and shape of this shoe is specifically made to ensure an equal balance between heel and toes to help those with high arches to be able to walk or run comfortably. The Saucony Men’s Triumph 11 Running Shoe are priced between $77.50 to $159.99 they are an affordable and good looking pair of shoes that will provide users with months and even years of use. Whether you only run a couple miles a day or you like to challenge yourself to 16 mile runs on a regular basis, the Saucony Men’s Triumph 11 Running Shoe will not allow you to feel pain or even blisters. These classic flats make life easy for women who can no longer wear heels, but would like to look chic and put together for work or social visits. The Orthaheel Elisa Mary Jane’s are designed with high arches in mind, so that comfort and support are first and foremost. The rubber sole is what comfortable shoe dreams are made of and the leather exterior keeps them looking pretty for months to come. They are especially fitting for women with wider feet, but wear well for any feet size when you purchase the right size. They are a nice look for ladies who are tired of wearing comfortable shoes that look like they belong on their grandmothers. These shoes are both fitting and unique and while some people may consider them to lack the ultimate arch support, there is plenty of room for an added insole if need be. It could depend on how high your arch is and how many hours of use that you hope to get out of them. At $64.97, they are neither the most affordable shoes nor the priciest, but they do provide long-lasting use with quality materials. We know that when you have a high arch, wearing certain types of shoes can be miserable to walk in, so when you find a shoe that was made for feet like yours, you don’t want to let it go. For many people who suffer from foot problems and pain, the Spira Women’s Classic Leather Walking Shoe is a “God-send.” While some may consider the $60.31 to $143.34 pricing to be somewhat high, the comfortable encasing that surrounds your foot more than makes up for it. Walking in comfortable shoes that were made for people like you can negate anything that could otherwise bother you. While these shoes may not be the most stylish babies around, they work great for those days when you know that you will be on your feet all day or need to walk a lot. What is quite special about these shoes is that they actually have spring technology. Think about a comfortable mattress that feels amazing to sleep on. Now think about your feet in something similar and voila, you have the shoes worthy paying over 60 dollars for. While they aren’t the prettiest shoes on the market, they serve their purpose, which is to keep your feet free from aches and pains, especially for long hours standing or walking. These shoes offer perfection in that they combine good looks with comfort and for anyone who knows what buying a pair of shoes for any type of condition is like, you know that isn’t always something that is a given. The Brooks Women’s Pure Cadence 3 Running Shoes have remarkable support for being such a sleek shoe and while many people may not like the style of laces and complain about them being a bit annoying, all around they are the ideal running shoe for those who want walking or running shoes that help to keep your feet free from pain. The Brooks Women’s Pure Cadence 3 Running Shoes come in bright colors, so if you prefer more subtle shoes, they may not be for you. Otherwise they are what comfort is all about for high-arched people. With DNA smart cushioning, these shoes bend and flow according to the shape of the individual who is using them. They also have split toe design to help you maintain stability and power on the run. These classic Nike running shoes have an attractive mesh and synthetic material exterior that allow your feet to breathe. While their top price of $224.95 may seem a bit high, Nike delivers the goods with the amazingly comfortable fit that will have people with high arches becoming fans of these great running shoes. Another way that Nike delivers as they often do is that while these are nearly just as comfortable as other shoes for high arched feet, they maintain style and sleek class to provide users with a pair of shoes that they will want to show off. If you have been looking for a pair of comfortable shoes that help to keep your feet from pain associated with high arches, the Nike Air Pegasus+ 30 Running Shoe provides your feet with just enough padding and space to ensure that your toes are not crunched up and your heels feel no pain as you pound the pavement. They are also a highly durable shoe that can last for a number of years, which helps the price tag make more sense. While they may not provide you with the ultimate warmth during winter months, they do allow your feet to stay cool for long jogs or runs throughout the year. They also have excellent traction for slippery days when it is wet out. For most people with high arches, they are a dream come true. The top walking shoes for people with high arches may seem a bit costly at $99.00 to $150.00 if you are comparing them to your average pair of shoes, but the benefits that they provide for people with high arches makes them worth every penny. The Brooks Women’s Addiction Walker may look like “mom” shoes, but you won’t mind a bit once you spend a whole day wearing them. With Hydroflow technology, the Brooks Women’s Addiction Walker Walking Shoes offer excellent comfort and shock absorption. They also have a MOGO midsole and PDRB triple density which mean cushioning and stability for hours of walking. To add to their beauty, they are also slip-resistant. If you work in a job that requires you to stand for a long time and to wear closed shoes and you suffer from high arch pain, these shoes may be all that you have been looking for and more. While they may not be what you would want to wear for a special event, for comfort on occasions when your feet demand it, the Brooks Women’s Addiction Walker Walking Shoes are what you want. These shoes look incredibly comfortable even just by looking at them and for the most part they are the idea of a perfect shoe for walking, especially if you suffer from foot issues. They have an Ortholite foam insert which is one main reason why they are a top favorite shoe for high arches in 2016. The New Balance Women’s WW847V2 Walking Shoe are priced at $99.97 to $125.95, but they come with a code for Medicare that some customers may be eligible for if they want reimbursement. With a 98% cotton to 2% elastane ratio, these shoes provide fabulous breathability. They are also an attractive pair of shoes as most New Balance brand shoes tend to be and while that is the least of your concerns as someone looking for shoes to take away your foot pain, it definitely encourages the purchase. There is something called engineered asymmetrical sole that helps shoes fit perfectly to the feet wearing them. The Saucony Men’s Grid Omni Walking Shoe is the ideal shoe for people who are looking for comfort due to its multiple beneficial features. While they are a walking shoe, some people may find them to be athletically sound and good for multiple uses. From working all day in them or wearing them for a leisurely stroll, they do not disappoint. The only thing to be aware of is that they don’t offer as much breathability as other shoes might, but all in all they are a comfortable shoe. They maintain the masculinity that a man wants in his shoes while helping those who may be suffering from high arch pain get the relief and comfort that they desire. At $38.00-$99.95, they are an affordable pair of shoes without taking away from quality. When comparing the four different pairs of men’s shoes on our list, we took into account pricing, comfort, and style. The Saucony Men’s Grid Omni Walking Shoe definitely win in the pricing department at prices as low as $38.00, whereas the Nike Air Pegasus+ 30 Running Shoes are considered highly comfortable for athletes who want to keep up with running even while dealing with high arches. The Brooks Men’s Adrenaline GTS 14 Running Shoe may not be as elegant in appearance as the previous pair of mentioned shoes, but they provide extreme comfort and support which is high on our list of importance. Last, but not least the Saucony Men’s Triumph 11 Running Shoe offer durability and comfort, making them a great buy as well. If you like sandals and open shoes, you may find the reasonably priced pair of Vionic with Orthaheel Tide II Women’s Sandal to be exactly what you are looking for. If closed shoes are a requirement for your job and comfort is a must for your long days on your feet, the Spira Women’s Classic Leather Walking Shoe are the presentable and comfortable shoes you need while staying busy. The Orthaheel Elisa Mary Jane’s Women stay away from the “tennis shoe” and sandal style to provide women with a more classic and chic look for times when you may need to walk a lot, but look good doing it. While nothing can compare to wearing high heels as a woman, comfort sometimes much means more than beauty and these shoes help people with high arched feet have variety in their wardrobe, which is just what any woman wants. Brooks Women’s Pure Cadence 3 Running Shoes on the other hand are the ideal shoes that you can turn to for comfortable exercise and will help your feet remain pain-free even after an hour jog. The Brooks Women’s Addiction Walker Walking Shoes are just as their name implies, the perfect walking shoes. While they may not be the most stylish pair of shoes, they definitely work for what they were made for, which is lots and lots of painless walking. Looks may matter, but being able to walk without pain matters too and these shoes are proof of this. New Balance Women’s WW847V2 Walking Shoe are a good looking pair of shoes, as far as high arch shoes are concerned and they can even be for free if you qualify for Medicare. They are pretty for a pair of tennis shoes and can be used for a variety of walking and working occasions, always providing comfort. Their laces are more comfortable than the Brooks Cadence 3 Running Shoes, but they aren’t as lightweight. The winner that we consider to be the best shoe on this list has to be the one that offers the most comfort and functionality for walking. As anyone with a high arch knows, this can be even more important than how your shoes look. Comfortable walking that is free from pain is worth every penny. The Brooks Women’s Addiction Walker Walking Shoes include a number of components that make them the most reliable and durable shoes on our list. With their Hydraflow technology they provide your foot with some type of shock absorption that keeps your heels from receiving jolts of pain while walking. They also have PDRB triple density that mean complete comfort and stability. While they may not be as pretty as the New Balance Women’s WW847V2 Walking Shoe or other shoes on the list, they will work wonders for long hours on the job or walks with the family in the park and that is, after all, why you are reading this list. At $99.99 to $150.00, they are fairly priced for the myriad of quality features that they offer.